An air-launched ballistic missile or ALBM is a ballistic missile launched from a bomber. An ALBM allows the launch aircraft to stand off at long distances from its target, keeping it well outside the range of defensive weapons like anti-aircraft missiles and interceptor aircraft. Once launched, the missile is essentially immune to interception. This combination of features allowed a strategic bomber to present a credible deterrent second-strike option in an era when improving anti-aircraft defences appeared to be rendering conventional bombers obsolete. The ALBM concept was only seriously studied in the US, largely as a way to ensure the usefulness and survivability of their large bomber fleet. After testing several experimental designs as part of the WS-199 efforts, the USAF began development of the GAM-87 Skybolt missile with range on the order of 1,150 miles (1,850 km). The only other major force relying on strategic bombers was the Royal Air Force, who also selected the Skybolt to arm their V bomber fleet. The Soviet Union does not appear to have seriously studied the concept, moving their strategic force directly to ICBMs. Skybolt ultimately failed several key tests, while the US Navy's UGM-27 Polaris offered the same advantages and more. Skybolt was cancelled, leading to the Skybolt crisis and an agreement to sell Polaris to the Royal Navy as part of the Nassau Agreement. The concept saw little active development until the 1970s when ICBM warheads began to become accurate enough to attack other ICBMs while they were still on the ground. 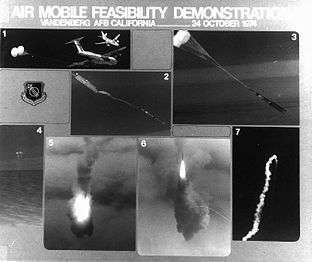 The US carried out several experiments using existing missile designs dropped from cargo aircraft, but ultimately abandoned this line of research entirely. No further strategic ALBM development has been carried out, and this class of missile never saw active use. The only known missile of this type that was intended for operational service, the GAM-87 Skybolt, intended to be launched from Boeing B-52 Stratofortress and Avro Vulcan bombers, was in development by the United States Air Force, with the United Kingdom as a customer. In 1962, with technical difficulties and costs mounting, the program was cancelled, with the United States and the UK concentrating on the UGM-27 Polaris submarine-launched ballistic missile instead. The Israeli Sparrow target missile is used to test the Arrow anti-ballistic missile system. ↑ Jim Miklaszewski, Courtney Kube and Alastair Jamieson (September 3, 2013). "Amid Syria tension, Israel test-fires missile over Mediterranean Sea". NBC News.